• Factory direct pricing for high quality baked enamel, kiln dried cloisonné lapel pins. • Priced at under $2 each, for full color, full size pins. • Great item for men and women. Setup charge are from $25.00 to $95.00 depending on the size of order and complexity of artwork. 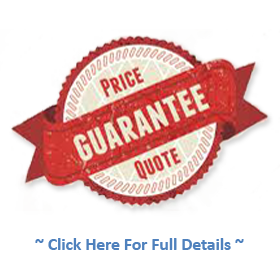 We will quote exact charge once we review your artwork and BEFORE any order is produced. All prices are good for lapel pins up to 1" in size and 6 colors. Additional size is 4¢ per 1/16" and additional colors are 10¢ per color over 6 colors. Regular die-cutting is included in the $50.00 Setup price but if the pin is a complicated shape or cutout there may be a slight upcharge and we will discuss this before any production is made. Color stones are 50¢ each for all colors and look like genuine gemstones. The pin photos above are examples of pins we have made for nonprofits, associations and companies all over America. We are experts at designing Custom Lapel Pins using YOUR LOGO as the feature point of the pin. When you need to commemorate a special event and recognize people, a Custom Lapel Pin is one of the best ways to do it. 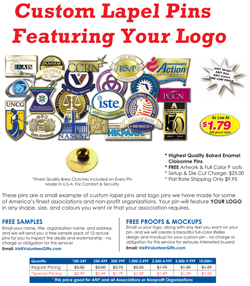 Lapel pins with YOUR LOGO create pride and loyalty, and they are one of the most effective promotional products in America, especially at a budget friendly price of under two dollars each. We will turn YOUR LOGO into a beautiful lapel pin and there is no charge for samples, art proofs and mockups. Simply email me at Rick@VolunteerGifts.com and I will be glad to send you a full color, lifelike mockup showing you exactly what your own lapel pin will look with your logo. In addition, if you want us to duplicate a pin you have already made in the past we do that too. Important: Our pins are made with hand applied, kiln dried enamel and are "dimensional." That means if you rub your finger or thumb or finger over the pin you "feel" the graphic and text because it is raised, not flat. Our pins are NEVER made with computer art or flat prints. The co-owner of our company, Iris Hyman has personally designed lapel pins for National Hospice, Medical Associations, IBM, the U.S. Army, U.S. Navy as well as the Visitor's Center at the U.S. Capitol in Washington, DC.